Back in the late 1990’s I was working with one of my many semi-conductor clients on their ISO 14001 Environmental Management System. A hallmark of ISO 14001 is “continual improvement”, focused primarily on going beyond compliance to reducing the overall environmental impacts and footprints of operations. This particular company had identified hazardous waste generation as a “significant aspect” of its operations and developed some programs and targets intended to reduce generation. One of the facility engineers was very excited one day when I showed up at the facility, proudly telling me that the company had managed to reduce waste generation by 25% over the past several months since he’d started tracking metrics. “That’s great!” I said. “How’d you do it?” He responded, “Well I ‘m not sure exactly”. So I prodded. “How has production at the plant been the last quarter?” “Well, it’s down…um, about 25%”, he answered in a muted tone. See a problem here? The company didn’t “normalize” the data (pounds of waste generated per number of units produced, for instance). So in effect, there was no “continual improvement. Oh well, back to the drawing boards! So it was interesting to read a summary of Green Research’s latest report, “Setting and Managing Sustainability Goals: Trends and Best Practices for Sustainability Executives. I had the pleasure of meeting Green Research’s founder, David Schatsky, at the recent Sustainable Brands ’11 Conference in Monterey, California. In this latest report, David seems to have touched on some issues which get to the core of a value-added sustainability initiative…that being, demonstrating “continual improvement”. A quarter of the 32 sustainability executives surveyed in Europe and North America for the study say their companies have set “aspirational” sustainability goals and lack a clear plan to achieve them. 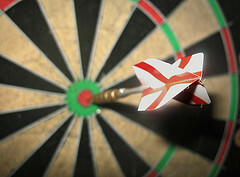 Over 40 percent said progress on sustainability goals is reported to senior management only semi-annually or annually. 57 percent of respondents characterized at least some of their sustainability goals as “stretch goals” – that is, challenging but probably achievable – and 54 percent said at least some of their goals are “realistic”. As Green Research’s study revealed, without an effective strategy to establish an internal benchmark for continual improvement, it becomes harder to innovate, advance and proactively respond to stakeholder expectations. Finally, good metrics if applied properly will foster innovation and growth. Therefore, it’s vital that there be a systematic process in place that maintains focus on continual improvement. Continual improvement is the primary driver for monitoring and measuring performance. If metrics don’t add value, they will not support continual improvement and eventually will not be used. It’s a vicious cycle that can be avoided if the proper system is firmly implanted in organizational strategy and operations. Many times over the past several months, I’ve been asked by colleagues and clients”what can I measure that means something”. And I answer them usually by asking “what matters to your organization and its stakeholders”? “I see what your saying”, they say “but I can’t always see the payback”. Well, sometimes the “payback” is hidden and can’t always be realized in tangible, hard dollar terms. Sometimes, especially if companies are not water, energy or resource intensive, or don’t produce a lot of waste byproducts, you need to peel off some layers. What this often means is looking at other production, operational or worker activities that can’t be measured in hard dollars but in terms of “efficiency”. 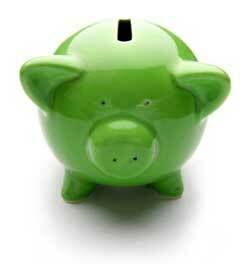 Sometimes metrics can be measured in terms of avoided costs rather than actual expenditures. As an example, a client of mine “avoided” $2.4 million in accrued fines and violations (over a three year period) due to enhanced sewer infrastructure maintenance and reduced response times to effluent spills when they occurred. 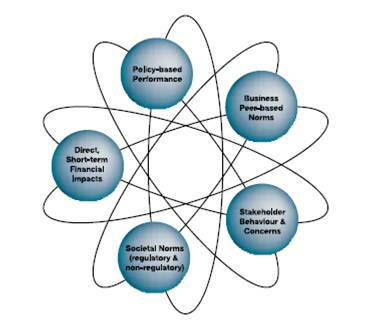 As the Green Research found, many companies initially establish said that “targets for realistic or stretch goals…through a bottom-up process, beginning with a baseline of current performance.” I view this finding as similar to what I coach my clients to do in environmental management system or sustainability engagements- perform a risk-based evaluation of what poses the greatest environmental, social or governance risk and establish measurable (and achievable) objectives and targets. Some of my clients like the Natural Step “back casting” process too , which attempts to envision a company’s “desired state”, measure a baseline “current state”, and fills in the gaps with programs and activities intended to reach the desired state. As I mentioned in last year’s post, once organizations decide what’s important to measure to meet sustainability related objectives, they needed to assure that they actually track metrics, report, calibrate and keep on measuring. 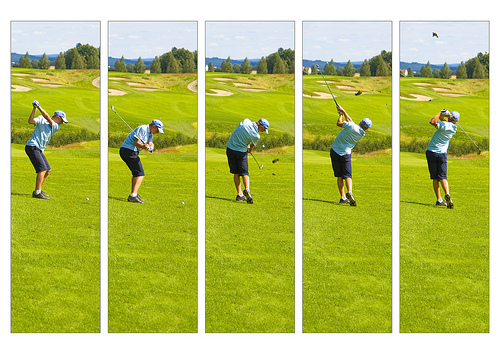 It’s called keeping your eye on the ball. And this applies to supply chain management as well. As I have reported in this space many times before, supply chain sustainability and responsible sourcing are two key ingredients for an organization to consider itself to be “truly” sustainable. Many of an organizations greatest product and operations related impacts (like carbon emissions, resource or toxic chemical inputs, etc.) actually come from within its upstream supply chain. Measure things that add value to organizational decisions. Measuring for the sake of measuring is a waste of time. 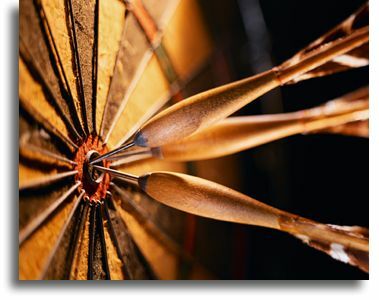 Make goal-setting a 360-degree exercise- Look inward through the organization rank and file for innovative ideas. Seek advice and input from external stakeholders too (your suppliers and customers matter too!). Own the goal and be accountable. It’s not likely that organizations will succeed in meeting their goals without someone keeping track. Make sustainability performance part of personal or group performance evaluations. Measure, Report, Repeat. Don’t stop at the first sign of success or trouble. Look for ways to press on, raise the bar and continually improve. Report progress regularly (sometimes monthly, sometimes quarterly. It all depends on what is being measured. Go Short, Go Long. Set some targets as short term goals, but think long term too (three to five years out), and in alignment with corporate strategies. Most large companies like my client (Johnson & Johnson), Unilever, Sony and many others usually set five to eight year planning horizons. 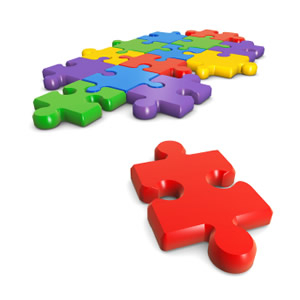 Measure things that compare well but slightly differentiate yourselves from your competitors. Novel and unique metrics are just as important to differentiating you as your products. Seek out globally-recognized metrics (like the Global Reporting Initiative) to assure that multi-national companies who also measure sustainability metrics can apply the data to their own goals. If you are a large company with multiple department, divisions or sites, the metrics of the subordinate organizations must be able to be “rolled up” in a way that addresses the entire organization but still meets site or department specific needs. Report the Bad with the Good: No one’s perfect and a little self deprecation, even in business can pay handsomely from a reputational point of view. In this WikiLeaks era, information moves swiftly. Stay ahead of “the story”, own up to the shortfalls, you’ll be forgiven and given more credit for your successes. Build off of prior continual improvement initiatives to track perform over longer periods of time. It’s not like you flicked on a switch one day and became the sustainable organization that you aspire to be. It takes time. On second thought, I did win a “big” race. My freshman year in high school I placed first in a 100 yard Individual Medley event against an arch rival high school in the Chicago suburbs. That was my greatest moment in the pool…for a race many said I wouldn’t even finish. 2010 marked a watershed moment in supply chain sourcing among worldwide manufacturers and retailers. Sustainability observers and practitioners read nearly weekly announcements of yet another major manufacturer or retailer setting the bar for greener supply chain management. With a much greater focus on monitoring, measurement and verification, retailers and manufacturers Wal-Mart, Marks and Spencer, IBM, Proctor and Gamble, Kaiser Permanente, Puma, Ford, Intel, Pepsi, Kimberly-Clark, Unilever, Johnson & Johnson, Herman Miller among many others made major announcements concerning efforts to engage, collaborate and track supplier/vendor sustainability efforts, especially those involving overseas operations. Central to each of these organizations is how suppliers and vendors impact the large companies’ carbon footprint, in addition to other major value chain concerns such as material and water resource use, waste management and labor/human rights issues.Meanwhile, efforts from China’s manufacturing sector regarding sustainable sourcing and procurement, was at best, mixed with regard to proactive sustainability. From my perspective as a U.S. based sustainability practitioner (with a passion in supply chain management), the challenges that foreign businesses with manufacturing relationships in China can be daunting. Recent events concerning Apple Computers alleged lax supplier oversight and reported supplier human rights and environmental violations only shows a microcosm of the depth of the challenges that suppliers face in managing or influencing these issues on the ground. Apple recently did the right thing by transparently releasing its Apple Supplier Responsibility 2011 Progress Report, which underscored just how challenging and difficult multi-tiered supply chain management can be. But all is certainly not lost and many companies have in recent years begun to navigate the green supply chain waters in China. According to a World Resources Institute White Paper issued in the fall of 2010, China faces a number of supply chain challenges. First, the recent spate of reports alleging employee labor and environmental violations can place manufacturing partnerships with global corporations at risk. According to the report, Chinese suppliers that are unable to meet the environmental performance standards of green supply chain companies may not be able to continue to do business with such firms. Wal-Mart has already gone on record, announcing that it will no longer purchase from Chinese suppliers with poor environmental performance records. In order to be a supplier to Wal-Mart, Chinese companies must now provide certification of their compliance with China’s environmental laws and regulations. Wal-Mart, like many other IT and apparel manufacturers also conducts audits on a factory’s performance against specific environmental and sustainability performance criteria, such as air emissions, water discharge, management of toxic substances and hazardous waste disposal. 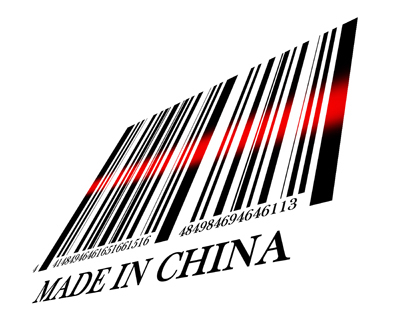 These actions are extremely significant as Wal-Mart procures from over 10,000 Chinese suppliers. This increased scrutiny on environmental and corporate social responsibility through supplier scoring and sustainability indexing, says the WRI report may trump price, quality, and delivery time as a decisive factor in a supplier’s success in winning a purchasing contract. Finally, what good news I hear about the depth of environmental regulations on the books in China is buffered by the apparent lax enforcement of the rules and regulations. That is however appearing to change. The WRI report indicated that the Chinese State Council is directing key government agencies, including the National Development and Reform Commission, the Ministry of Finance, and the Ministry of Environmental Protection to prohibit tax incentives, restrict exports and raise fees for energy intensive and polluting industries, such as steel, cement, and minerals extraction. Also, it’s been reported in the past years that the People’s Bank of China and the Ministry of Environmental Protection are also working with local Chinese banks to implement the ‘Green Credit’ program, which prevents loans to Chinese firms with poor environmental performance records. In addition, the National Development and Reform Commission and the Ministry of Finance have issued a notice to all Chinese central and local governments to purchase goods from suppliers that are ‘energy efficient’. Finally, on a local level, governments have developed preferred supplier lists for companies producing environmental-friendly products for their purchasing needs. “Extended green investment “payback”: While improving resource consumption, such as energy and water, provides long-term cost savings, the payback for making such environmental investments may be as long as three years, which is financially impossible for many Chinese suppliers. Lack of financial incentives from green supply chain buyers: Multinational buyers are often unwilling to change purchasing commitments and long-term purchasing contracts to Chinese suppliers that make the investments to improve their environmental performance. 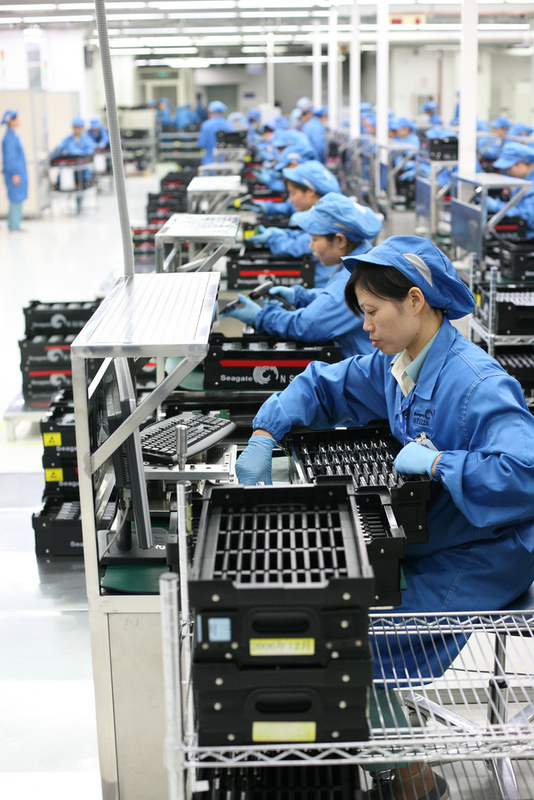 Rising operational costs: Chinese suppliers face rising resource and labor costs. For example, factory wages have increased at an average annual rate of 25 percent during 2007 to 2010. Rising costs dissuade suppliers from making environmental investments which may raise operating costs. Limited access to finance: The majority of Chinese suppliers are small and medium-scale enterprises (SMEs) with limited access to formal financing channels such as bank loans. Chinese SMEs account for less than 10 percent of all bank lending in China, and as a result, Chinese suppliers frequently do not have the capital to make the necessary environmental investments. Intense domestic and global competition: Chinese suppliers face intense competition from thousands of firms, both domestic and international, within their industries. This intense competition puts constant pressure on suppliers to cut costs, which can include environmental protections, in an effort to stay in business. Leading edge, sustainability –minded and innovative companies have found “reciprocal value” through enhanced product differentiation, reputation management and customer loyalty. I recently highlighted the model efforts that GE has implemented with its China based suppliers to implant responsible and environmentally proactive manufacturing into their operations. GE’s comprehensive supplier assessment program evaluates suppliers in China and other developing economies for environment, health and safety, labor, security and human rights issues. GE has leaned on its thousands of suppliers to obtain the appropriate environmental and labor permits, improve their environmental compliance and overall performance. In addition, GE and other multi-national companies (including Wal-Mart, Honeywell, Citibank and SABIC Innovative Plastics) have partnered to create the EHS Academy in Guangdong province. The objective of this no-profit venture is to create a more well-trained and capable workforce of environmental, health and safety professionals. Many of my prior posts have highlighted the critical needs for increased supply chain collaboration among the world’s largest manufacturers in order to effectively operationalize sustainability in Chinese manufacturing plants. This is especially evident for large worldwide manufacturers operating subcontractor arrangements in developing nations and “tiger economies”, such as India, Mexico and China (and the rest of Southeast Asia). Global manufacturer efforts underscore how successful greening efforts in supply chains can be based on value creation through the sharing of intelligence and know-how about environmental and emerging regulatory issues and emerging technologies. Suppliers and customers stand so much to gain from collaboratively strengthening each other’s performance and sharing cost of ownership and social license to operate. But as I have stated before, supply chain sustainability and corporate governance must first be driven by the originating product designers and manufacturers that rely on deep tiers of suppliers and vendors in far-away places for their products. Reports surfaced this week about a Deloitte survey of a relatively small group of 50 executives taken from late 2009 to early 2010. However, the survey covered five industry sectors: automotive, consumer products, process and industrial, technology, and telecommunications. While there was disagreement in some industry’s over what constituted a ‘green job’, there was widespread agreement in a number of areas. Almost all surveyed indicated that sustainability priorities were at least partially aligned with their companies’ priorities. A total of 65 percent discussed priorities related to improving the environmental sustainability of their companies’ products. – Aligning sustainability strategy with business strategy. 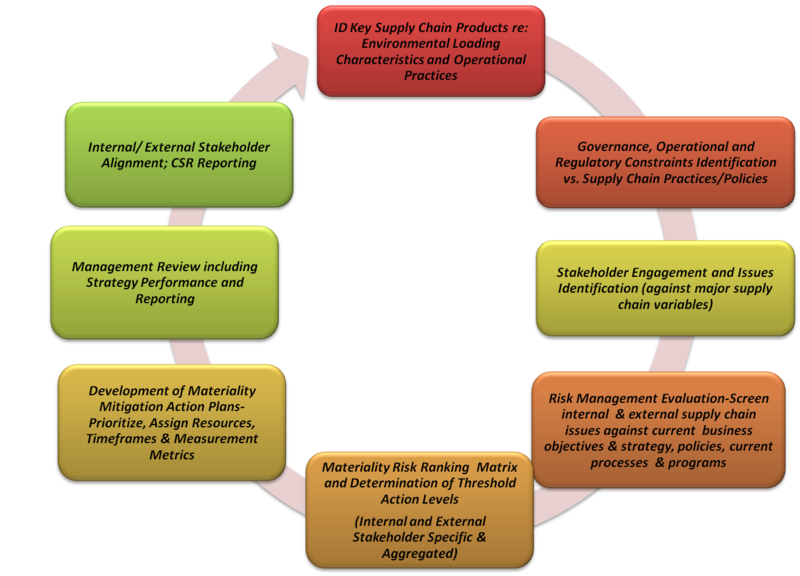 – Integrating sustainability into operations and processes across the value chain. – Structuring non-traditional collaborations and extending existing collaborations. – Setting up a governance structure that is supported by the right infrastructure. 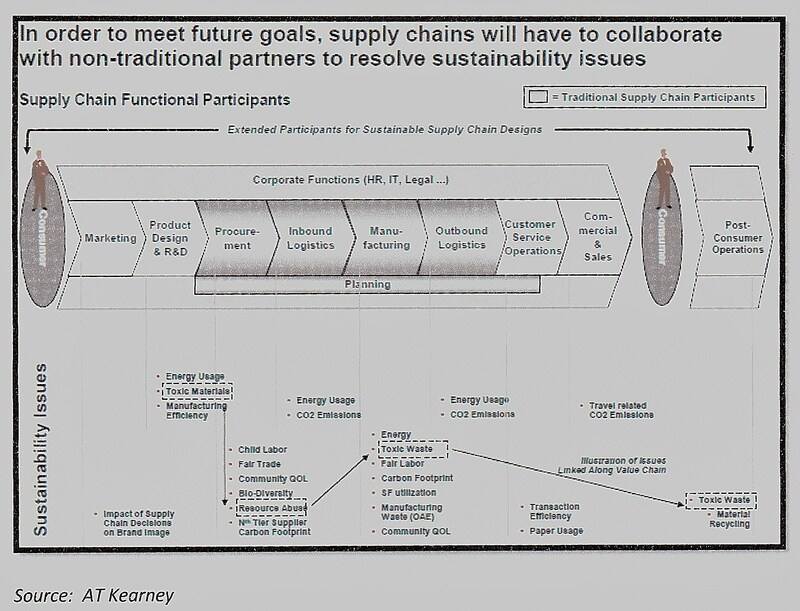 On the supply chain point, the survey recommended as I have several times in this space the importance of driving sustainability upstream (vendors) and downstream (customers) in the product/service value chain through collaboration. Efforts taken throughout the value chain broadens the reach of sustainability initiatives and makes it less isolated. So if you’re a supply chain pro (as I assume that if you’re here, that’s the case), you may be asking “Where do I get started down this green path’?” The aspects of supply chain management that can benefit from a sustainability focus, are well, all of them: product design, planning/ forecasting, manufacturing, order management, transportation, distribution, service management and reverse logistics. However, if you wish to start somewhere and get some huge bang for your buck, start with sourcing and procurement. When you think of sustainable sourcing, consider it as a process of purchasing goods and services that takes into account the triple bottom line or TBL (People, Planet, Profit) aspects of a product and its use. Sustainable sourcing considers how products are made, where and from whom they (and their components) come from, how they are transported, and how they are ultimately disposed of. Companies excelling at sustainable sourcing strive to ensure that their products and components meet or exceed environmental and social expectations. In future postings, I will delve more deeply into TCO related methods to supplement spend analysis in the procurement process. In the meantime, rest assured that more companies that are seeking to manage the life cycle environmental impact of their products. They’re finding sustainable procurement to be a valuable tool to quantify and compare a product or component’s lifetime environmental and social impact while positioning the company for smart growth in a rebounding economy. Well, can the economic tides be turning? In my former home base of San Diego, they had a saying: “It takes a long time to carefully turn an aircraft carrier around”. Capgemini Consulting’s new study of 300 leading companies across Europe, US, Asia-pacific and Latin America states that economic recovery has surpassed economic downturn in the list of business drivers for 2010. More than 50 percent of the participating companies indicate they will start up or continue with operational excellence / LEAN. Another obvious direction – reduces waste, optimize resources. This should translate into bigger profits and competitive position. Sustainability is the second most important business driver for 2010 — up 16 percent over last year. However, the survey results suggest that this has not yet directly translated into a significant increase in supply chain sustainability projects. Well, remember that aircraft carrier quote that I just mentioned? These findings really suggest that while the road to recovery is long, that much foundational work remains. But the trend from survival to revival is in play now. Perhaps the biggest take-away from this report is the increasing emphasis of supply chain management in creating the proper ingredients of a successful business strategy. And coincidentally, the concept of a Green Supply Chain is gaining interest among operations practitioners as a sustainable and profitable undertaking. A Green Supply Chain can be thought of as a supply chain that has integrated environmental thinking into core operations from material sourcing through product design, manufacturing, distribution, delivery, and end-of-life recycling. 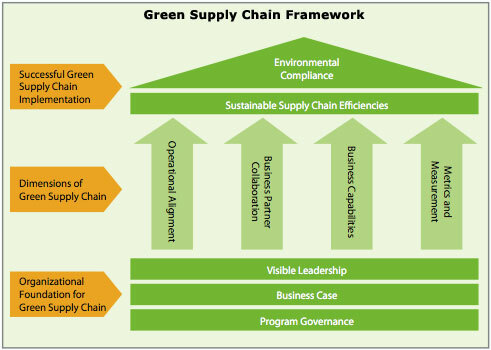 The implementation of Green Supply Chain initiatives has evolved from strictly a compliance issue into a means of generating value. Traditionally, companies incorporating green projects have focused solely on cost avoidance by assuring compliance, minimizing risk, maintaining health, and protecting the environment. In the emerging value-creation model, implementing green initiatives along a company’s supply chain can raise productivity, enhance customer and supplier relations, support innovation, and enable growth. The Green Supply Chain is no longer exclusively about green issues, but also about generating efficiencies and cost containment. As organizations restructure to reduce their company’s environmental footprint, supply chains have increasingly become a key area of focus. Improvements in transportation efficiency, operations, raw material selection and packaging are all topping the list of “green” supply chain initiatives. improve product, process, and supply quality and productivity. Over the past several years, studies have been performed worldwide comparing ISO 14001-2004 and its value in development of green supply chains. Suppliers without an environmental management system will feel increasing pressure to modify their practices or risk losing customers, and will be subject to higher costs for licenses, inspections and insurance. Will the service provider enhance the cause of sustainability both upstream (i.e., primary customer/end customer) and downstream (i.e., all tiers of supply base, including logistics service providers)? Will some relationships drive significant redesign of the supply chain, including product innovations and modifications (e.g., collaborative development of decomposable packaging material? Is your supply chain implementing progressive environmental management systems to manage their environmental footprint? Establish a more cohesive collaborative model in transport, warehousing and distribution that will drive efficiencies up and incremental costs down, while reducing environmental impacts throughout the supply chain. 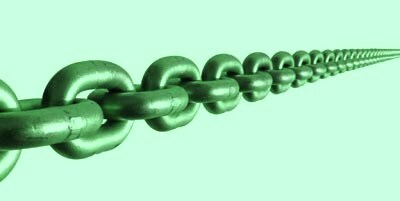 The Green Economy Post assembled a number of Green Supply Chain studies to assist you in your efforts to understand and address these issues in your business (15 Green Supply Chain Studies You Should Know About http://bit.ly/6X3YDU). Environmentally responsible procurement, in alignment with your company’s environmental sustainability values, is critical for organizations that desire to manage their environmental risk and maintain a competitive advantage. Not only does this mean that businesses must choose their suppliers well, they also have to ensure that suppliers comply with the standards they claim to meet. I will have the honor of conducting a breakout session on this topic on April 13th at the Aberdeen Research’s Supply Chain Management (SCM) Summit in San Francisco, CA (http://summits.aberdeen.com/index.php/Supply-Chain-Management-Summit/2010-scm-summit-overview.html). Hope to see you there!